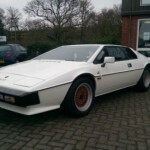 At the end of 1975, the newest design from the Lotus company was presented at the Earls Court Motor Show in London – the Esprit that had been created by Italian designer Giorgio Giugiaro. 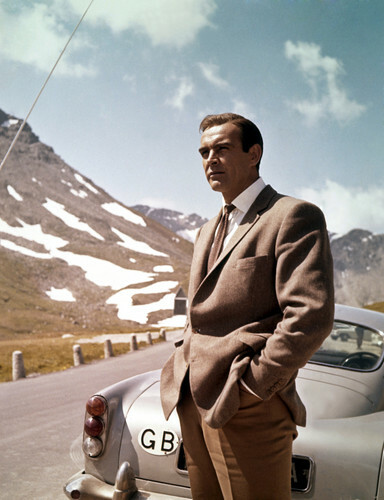 The car not only impressed the automotive world, but also producer Broccoli, who found a pre-series model directly in front of the Pinewood Studios in London. The car had been parked there by a Lotus manager. 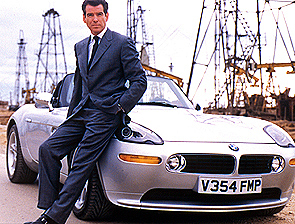 Don McLaughlan, a PR man from Lotus, had heard that the preparations had begun for a new 007 adventure, and he wanted to make the car available for the production. 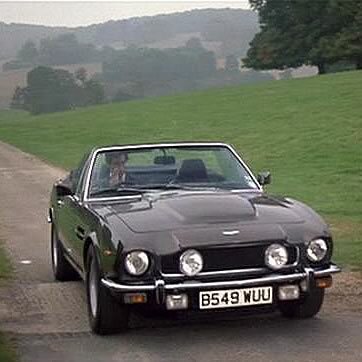 Experience with the vehicles from other films had shown that the publicity effect was enormous. 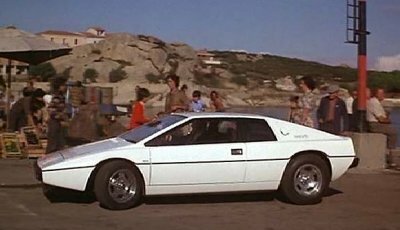 The works delivered two street-legal production vehicles which were only equipped with an additional piece of sheet metal beneath the radiator to protect the cars from the rough streets of the Costa Smeralda in Sardinia, where these sequences were to be filmed. 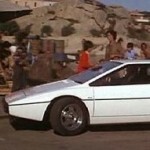 Additionally, six more bodyshells were delivered, one of which was sealed for underwater scenes. 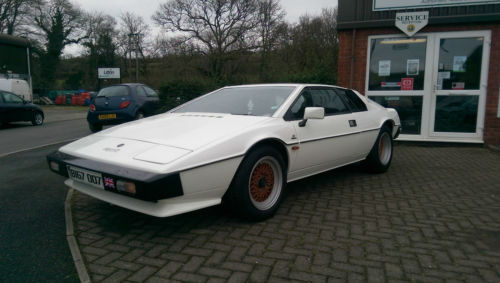 On the winding Costa Smeralda, the Lotus is chased by a black Ford Taunus and sprays cement out of four nozzles located behind the license plate in order to blind the Taunus driver. The cement, by the way, was nothing more than gray oatmeal that was squirted out of a truck that was carrying a hose device. The Taunus (which was attached to a crane in such a way that it was not visible to the camera) then flew down the embankment and landed squarely on the roof of a house. A specially installed metal slide generated the effect. 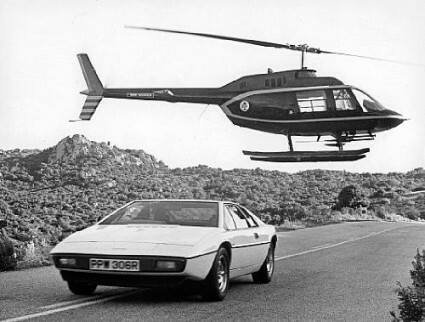 When the Lotus raced from the pier into the water, the crew used compressed-air rockets to accelerate the vehicle (which was guided with steel cables) up to a speed of 70 km/h. The vehicle was manned with dummies. For the miraculous transformation to a submarine, a full-sized model was used. The wheels folded to the inside, fins and a periscope came out. 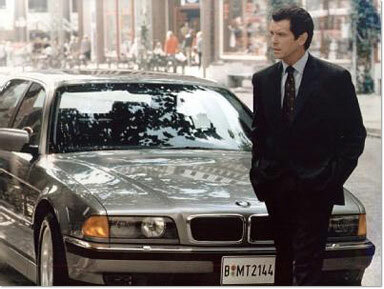 The scene was filmed in the Bahamas. The helicopter circling the submarine was a remote-controlled mock-up. 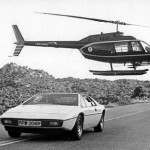 Nevertheless, for the scene that can be seen on the car’s monitor, a real helicopter was hung from a crane on the pier in Sardinia. A surface-to-air missile was then fired from the submersible car of original size, and the approx. 1.50- meter model of the helicopter exploded. 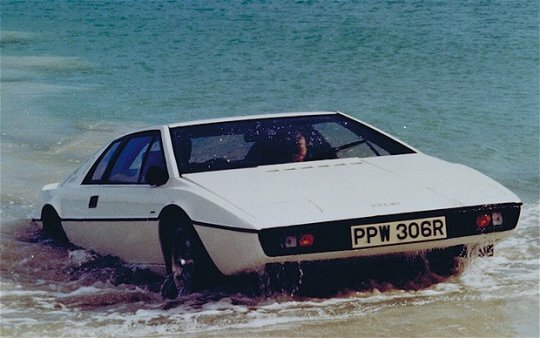 The movement of the Lotus under water was filmed with the original-size car. A diver hidden inside operated four battery- powered motors that allowed a maximum speed of ten knots. The film team wanted to ensure that the recordings did not include escaping air bubbles, so they performed different experiments with what are known as rebreathers (small devices that make it possible to breath underwater for a short time without making bubbles). Nevertheless, this idea was rejected because of safety considerations. 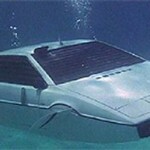 The driver went back to wearing his normal diving equipment. The Lotus defended itself using torpedos, a colored smoke screen, and mines. The diver actuated the triggering elements from inside. When the Lotus moved to the replica of the Atlantisunderwater station, a model that was made at a 1:4 scale was used again. At times it was remote controlled, at times it was moved along tracks that had been laid on the seabed. 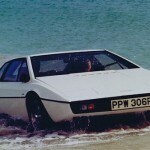 For the unforgettable scene in which the Lotus pops up out of the water and drives onto the beach, a vehicle equipped with a marine screw propeller is pulled out of the ocean along hidden tracks. Altogether, about twenty meters of tracks were laid under water. Mechanics, technicians, stucco specialists, and carpenters worked with stucco and wood for about four months for the entire sequence. Two camera teams, one of which was under the leadership of underwater specialist Lamar Boren, were then involved for the same length of time. 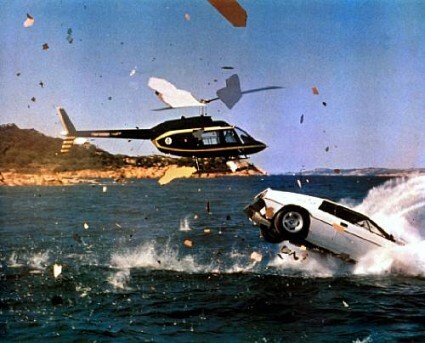 The stars, Barbara Bach and Roger Moore, never saw the Bahamas. 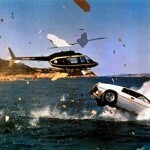 They did their fighting in the sealed car in the diving pool on the grounds of Pinewood Studios in London.